Both are made from various types of gas permeable plastic that allows the eye to ‘breath' while being covered by the lens. Many contacts are made from the new silicone hydro-gel materials allow more oxygen to reach the eyes, which can mean more comfort and a healthier appearance. Some lenses even have an FDA indication for alleviating symptoms of eye dryness. Rigid contacts [RGP] are used for longer ranges of time than the soft ones, and although they take some time to get used to, they have their intrinsic advantages. The durable plastics that rigid lenses are made of also make them less vulnerable to deposit buildup of microorganisms that could lead to eye irritants or infections. Some rigid types of contacts can be kept for years before being replaced with newer ones and this is very cost effective for anyone exclusively wearing contacts, but the initial cost is obviously higher for this reason. Financially, the rigid contacts are always cheaper if you can get used to them. The last advantage is that the durability of the material often gives better vision clarity than the soft contact lenses. 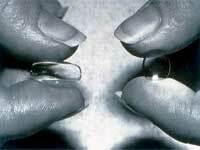 Soft contact lenses, on the other hand, can never be worn for such long periods of time. You can choose from daily, weekly and monthly varieties of soft lenses, but none that will last you any longer than that. Their main advantage over the rigid lenses is the fact that they are easily adapted to and cause very little initial discomfort. They are made of a very high percentage of water [between twenty five to almost eighty percent].